You are here: Home » MEDIA » Books » Something Coming Through by Paul McAuley (book review). 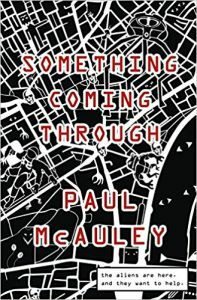 Something Coming Through by Paul McAuley (book review). When the alien Jackaroo come to Earth, they claim to be concerned only with the welfare of mankind. They provide access to fifteen extra-solar planets for mankind to colonise and from these worlds come a steady stream of alien artefacts from the lost Elder Cultures, artefacts that are little understood but that affect people in many strange ways. The world that Paul McAuley describes in ‘Something Coming Through’ is not so different from ours in many ways, full of familiar brands such as Burger King and GlaxoSmithKline, as well as well-known locations in London like Spitalfields Market. It’s also a world where a limited nuclear war has taken place and where alien technologies are beginning to benefit mankind, but where alien drugs and mind-altering memes are simultaneously making things worse. In this setting, Chloe Millar works for a private company that tracks down alien artefacts in competition with the authorities and other private concerns. It’s a setting that’s woven together with great realism by Paul McAuley. Meanwhile, on the planet Mangala, police detective Vic Gayle investigates a murder and a disappearance in a frontier city that has already come to resemble a crime-ridden city of Earth. Here things are subtly different, with alien ruins nearby, a mostly-desert planet and a subtle social hierarchy based on order of arrival on planet. Again, it’s a nicely-constructed and realistic society that Paul McAuley portrays. The two halves of the story follow timelines that gradually start to converge as the links between the two become evident. The fact that the book takes place several years after the arrival of the Jackaroo gives the two societies an interestingly embedded feel, while still allowing for a sense of newness. The main characters, Chloe and Vic, are old enough to remember life before the Jackaroo. Chloe had still been at school at the time, while Vic is older and had been a policeman in Birmingham before emigrating to Mangala. This gives them both interesting perspectives wherein they can reflect on the sometimes dubious benefits brought by the alien visitors. As the plot thickens, there is the addition of the UK Hazard Police, conspiracy theorists, rival drugs gangs and private security teams with questionable agendas. All of them are involved in one way or another with the mystery of two orphans, an alien artefact they possess and the insidious influence it is exerting on everyone they come into contact with. It’s a fabulously complex and compelling story that only gets stranger as it progresses. ‘Something Coming Through’ is a fresh and breezy tale, less cerebral and ‘hard SF’ than Paul McAuley’s ‘Quiet War’ series. I read his newest book ‘Austral’ recently and it has a similar feel: wonderfully described and atmospheric, interesting characters and gripping plot. The sequel ‘Into Everywhere’ promises to continue the story of the Jackaroo’s interactions with mankind and I plan to get hold of it as soon as I can. Austral by Paul McAuley (book review). « Hitchhiker’s Guide To The Galaxy Hexagonal Phase: signs up Professor Stephen Hawking.